PAFD’s Statement on the current massacre of peaceful Oromo protesters by the TPLF regime The long Oromo nation’s protest against the TPLF-led dictatorial regime was going on since November 12, 2015. The Oromo people is protesting across and in the whole districts in Oromia. The TPLF government repeatedly responded to the protesters in a brutal way using live ammunitions and has mercilessly killed over 670 Oromo so far. Hundreds have been wounded. 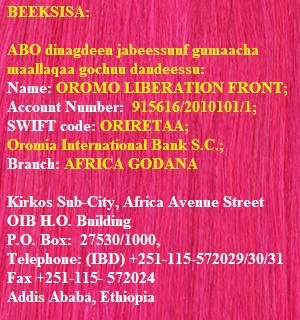 Over 50, 000 Oromo were arrested and tortured in known and unknown prisons. There was unknown number of disappearances. Among the dead, the majority are university and high school students, very young children, pregnant women, and the elderly. The TPLF assassinating squad not only killed people on the streets, but in their homes during the night time by breaking into their doors. Many people were taken from their homes and arrested, then taken to police stations, military camps, concentration camps and unknown places. Similar scenarios are unfolding in Benshangul, Ogaden Somali, Gambella, Amhara, Sidama, Konso, South Omo valley and the rest of the country. Human rights organizations have widely reported on the protests in Oromia in order to make the world community aware of the real scope of the protests and the brutality of the Ethiopian regime. The EU and US congress have expressed their “concerns” about the killings, large scale mass arrests and tortures of Oromo protesters thereby to urge the Ethiopian government to end the systemic harassment, killings, exclusion and marginalization of the Oromo people from economic, political and social lives. The recent shocking massacre was on 6 August 2016 where the Oromo People protested massively and all over Oromia to express their grievances and demanded their fundamental human and political rights. This round of protest that took place in over 200 towns in Oromia including in the capital city Addis Ababa. Once again this protest was encountered with a huge government crackdown and resulted in loss of many human lives, hundreds wounded, several thousand arrests and disappearances. In this protest, over 70 Oromos were recklessly brutalized and beaten and over 3,000 Oromos were taken to various prison, not counting the number of disappearances. The most devastated zones of Oromia were Awaday and Haromaya in East Hararge, Asasa in West Arsi, Dodola and Robe in Bale, Ambo and Walso in West Showa, and Naqamte in East Walaga among others. 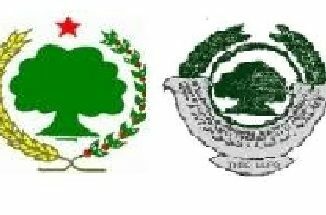 We, the PAFD member organizations representing the subjugated nations’ and peoples’ of over 67% Ethiopian population strongly denounce the brutal response of the government to the peaceful Oromo protesters. We believe the TPLF has blatantly denied of the rights of the majority of the empires’ population. This clearly discloses that the TPLF has failed to comply with its constitutions and international and regional laws and committed serious crime and mass violation of human rights on Oromos and other oppressed people for the last 25 years. PAFD is seriously concerned about the intentional silencing of peoples’ voices and side-lining the Peoples’ question for self-determination. We believe that the current denial of solving fundamental rights of peoples – political and economic rights- and diverting the peoples’ question towards mere lack of good governance will result in complete chaos in the country and instability of the region. This diversion of the real peoples’ question will not solve the problems, rather intensify the people resistance. We believe this will lead to the political and security crises that could engulf not only Ethiopia but also the Horn of Africa and broaden the chance for terrorism. 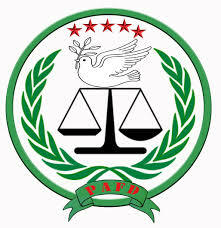 The PAFD strongly believes that effort of the Ethiopian partners to repair the already failed state in a name of good governance and we are deeply concerned about the Ethiopian partners continued support despite all inhumane activities exercised by the regime. 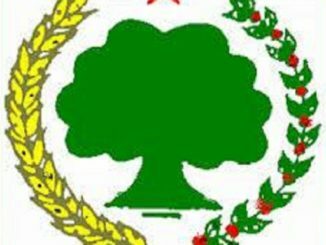 We are extremely concerned that the TPLF’s government’s brutal activities has been given deaf ear and we feel that the TPLF/ EPRDF is allowed and groomed to continue with its indiscriminate killings of unarmed civilians by endangering the lives of tens of thousands of Oromo, Ogadenia, Sidama, Gambella, Benshalgul, Konso and other civilians including children, pregnant women and elderly. We believe that ignoring the TPLF’s act of brutality and barbarism is not compatible with the mankind. So we ask the US government, the EU, the UN and individual partner countries to Ethiopia to seriously reassess their positions with regard to their relationship with the Ethiopian regime that is already failed state and increasingly subjugating, seriously betraying and widely ignoring and terrorizing its citizens. 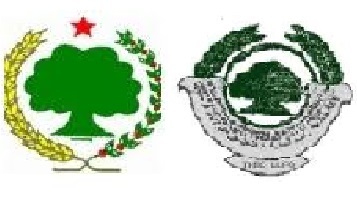 The PAFD would like to inform the Ethiopian regime and Ethiopian partners to refrain ignoring oppositions and trying to continue with status-quo by adopting exclusionist policy may dearly cost all stakeholders. If peace and stability has to prevail on Ethiopian soil in particular, in the horn of Africa in general, the rule of law and democratic principles must be consistently respected and they need to act now before it is too late. We also urge the Ethiopian Government partners to unconditionally stop providing financial, political and security supports to TPLF regime that is hell bent on remaining in power with all means including committing genocides of varying degrees in Oromia, Ogadenia, Sidama, Benshangul, Gambella, Konso, Kafa Shaka, Omo valley, Amhara and the rest of the country. We also strongly appeal to the Ethiopian partners to set up an independent body that investigates the killings and tortures committed by TPLF regime and bring the perpetrators to justice. We call upon the Ethiopian to stop killing their brothers and sisters and join the people for genuine change that will respect the wills of respective peoples. We also call the Liyu Police in Ogaden and that are working for Woyane Regime to stop instigating a war between, the Oromo and Somalis in order to prolong the regime to stay on power. Finally, we also urge all Ethiopians to unconditionally join the PAFD to progress the just causes of all peoples in Ethiopia. With our voices pulled together we will definitely materialize the PAFD call for transitional arrangement and make the desired change a reality.